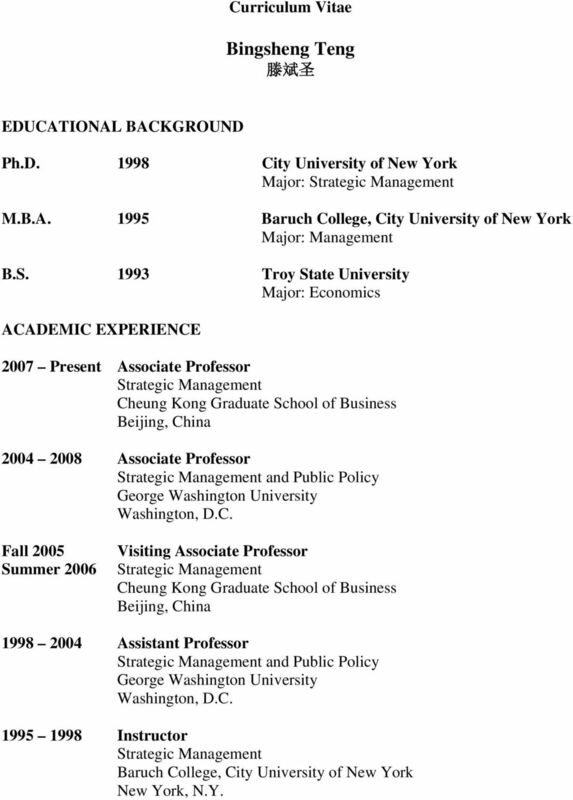 Download "Bingsheng Teng 滕 斌 圣"
1 Curriculum Vitae Bingsheng Teng 滕 斌 圣 EDUCATIONAL BACKGROUND Ph.D City University of New York Major: Strategic Management M.B.A Baruch College, City University of New York Major: Management B.S Troy State University Major: Economics ACADEMIC EXPERIENCE 2007 Present Associate Professor Strategic Management Cheung Kong Graduate School of Business Beijing, China Associate Professor Strategic Management and Public Policy George Washington University Washington, D.C. Fall 2005 Summer 2006 Visiting Associate Professor Strategic Management Cheung Kong Graduate School of Business Beijing, China Assistant Professor Strategic Management and Public Policy George Washington University Washington, D.C Instructor Strategic Management Baruch College, City University of New York New York, N.Y.
6 6 Journal of Systems Science and Systems Engineering National Science Foundation Organization Science Organization Studies Scandinavian Journal of Management Sloan Management Review Strategic Management Journal Thunderbird International Business Review Presentations Teng, B Institutional and Entrepreneurial Views of Alliance Emergence and Popularization. Paper presented at the annual meeting of the Academy of Management, New Orleans, LA. Teng, B Longitudinal Patterns of Alliance Formation in the Biotechnology Industry: Learning-by-doing and Institutional Views. Paper presented at the annual international conference of the Strategic Management Society, Baltimore, MD. 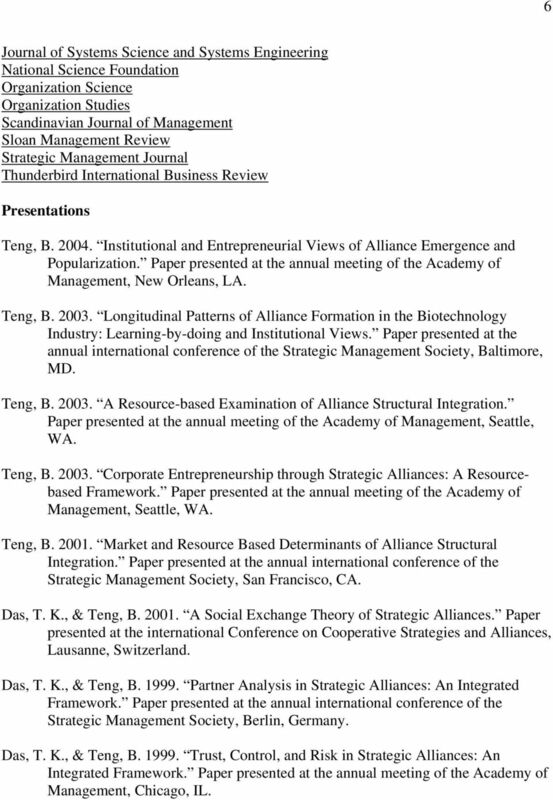 Teng, B A Resource-based Examination of Alliance Structural Integration. Paper presented at the annual meeting of the Academy of Management, Seattle, WA. 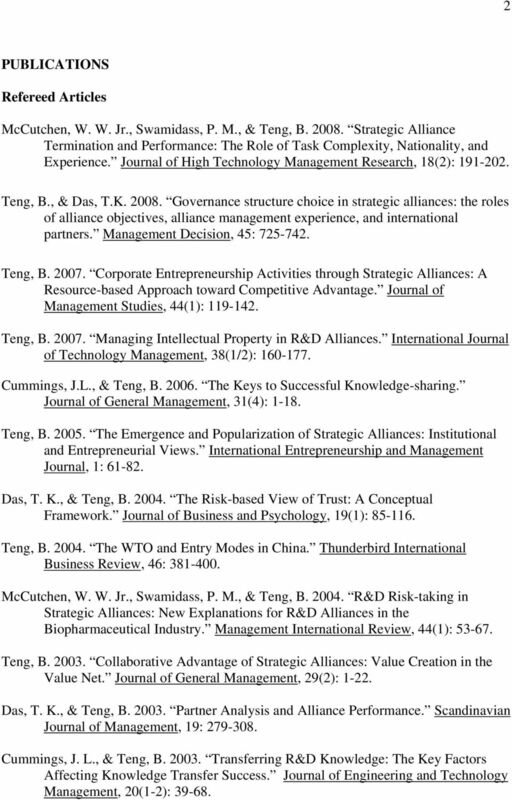 Teng, B Corporate Entrepreneurship through Strategic Alliances: A Resourcebased Framework. Paper presented at the annual meeting of the Academy of Management, Seattle, WA. Teng, B Market and Resource Based Determinants of Alliance Structural Integration. Paper presented at the annual international conference of the Strategic Management Society, San Francisco, CA. 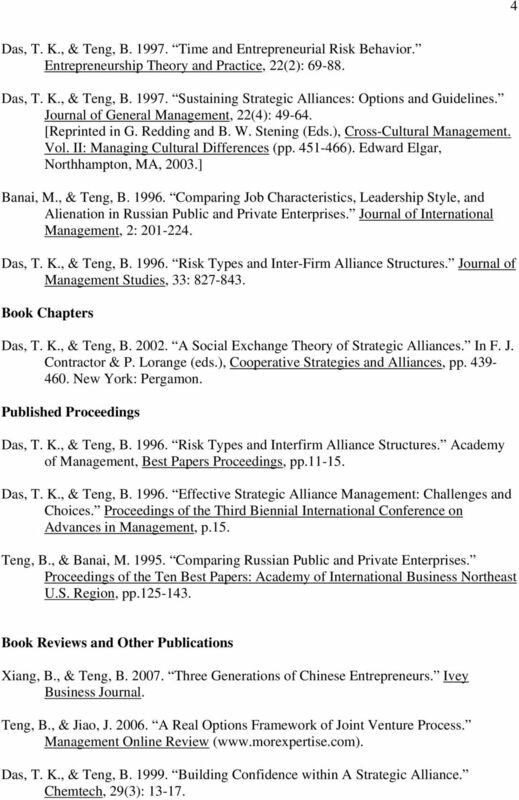 Das, T. K., & Teng, B A Social Exchange Theory of Strategic Alliances. Paper presented at the international Conference on Cooperative Strategies and Alliances, Lausanne, Switzerland. Das, T. K., & Teng, B Partner Analysis in Strategic Alliances: An Integrated Framework. Paper presented at the annual international conference of the Strategic Management Society, Berlin, Germany. Das, T. K., & Teng, B Trust, Control, and Risk in Strategic Alliances: An Integrated Framework. Paper presented at the annual meeting of the Academy of Management, Chicago, IL. 7 7 Das, T. K., & Teng, B Performance versus Stability in Strategic Alliances: An Empirical Investigation. Paper presented at the annual international conference of the Strategic Management Society, Orlando, FL. Das, T. K., & Teng, B The Risk of Trust: A Conceptual Analysis. Paper presented at the annual meeting of the Academy of Management, San Diego, CA. Das, T. K., & Teng, B The Dialectics of Strategic Alliances. Paper presented at the annual meeting of the Academy of Management, Boston, MA. 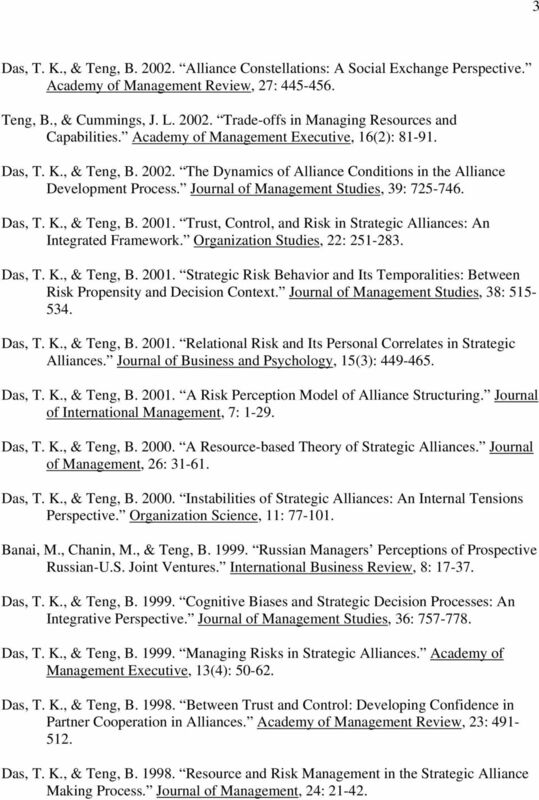 Das, T. K., & Teng, B Risk Taking Behavior in Strategic Decision Making: An Integrative Perspective. Paper presented at the annual meeting of the Academy of Management, Cincinnati, OH. Das, T. K., & Teng, B Strategic Alliance Structuring: A Risk Perception Model. Paper presented at the annual meeting of the Academy of Management, Cincinnati, OH. Das, T. K., & Teng, B Risk Types and Interfirm Alliance Structures. Paper presented at the annual meeting of the Academy of Management, Cincinnati, OH. 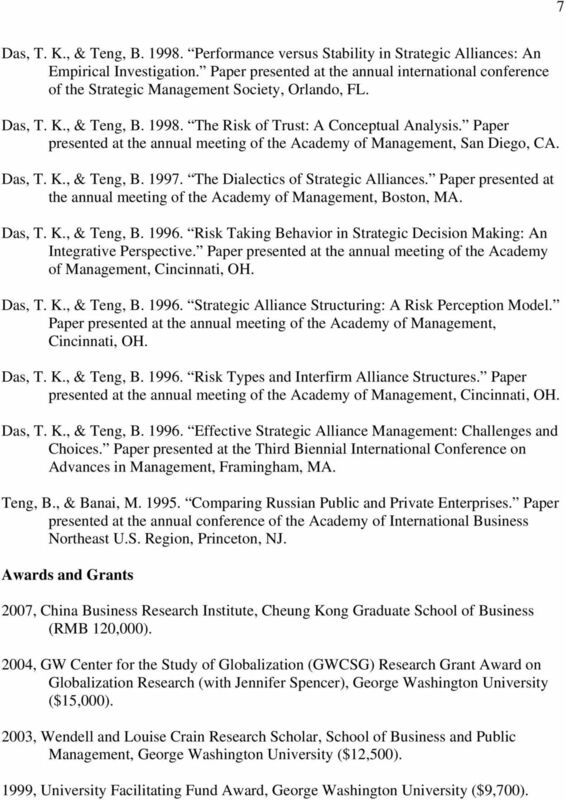 Das, T. K., & Teng, B Effective Strategic Alliance Management: Challenges and Choices. Paper presented at the Third Biennial International Conference on Advances in Management, Framingham, MA. Teng, B., & Banai, M Comparing Russian Public and Private Enterprises. Paper presented at the annual conference of the Academy of International Business Northeast U.S. Region, Princeton, NJ. Awards and Grants 2007, China Business Research Institute, Cheung Kong Graduate School of Business (RMB 120,000). 2004, GW Center for the Study of Globalization (GWCSG) Research Grant Award on Globalization Research (with Jennifer Spencer), George Washington University ($15,000). 2003, Wendell and Louise Crain Research Scholar, School of Business and Public Management, George Washington University ($12,500). 1999, University Facilitating Fund Award, George Washington University ($9,700). JUN YU School of Business Emporia State University Phone: (620) 341-5784 Email: jyu@emporia.edu Updated July, 2011 EDUCATION Ph.D. in Marketing 2002 University of Texas at Dallas, Richardson, Texas M.B.A.
Ayyagari, Meghana; Asli Demirguc-Kunt, and Vojislav Maksimovic, 2014, Who creates jobs in developing countries? Small Business Economics 43, 75-99. ARPITA JOARDAR Graduate School of Management Clark University 950 Main Street, Worcester, MA 01610 Phone: (508) 793 7688 E-mail: ajoardar@clarku. Fall 1976: Harvard University, Kennedy School of Government Teaching Assistant for Professor Richard Neustadt in "Law and Public Policy"
VITA Charles David SKIPTON Personal Information Home Address Office Address 10810 Kempton Court Dept of Economics / Sykes COB Tampa, FL 33626 University of Tampa TEL: (813) 541-5637 401 W. Kennedy Blvd. ELLEN E. ENGEL. Education Stanford University, Graduate School of Business, Ph.D. - Accounting, 1997. KUMAR R. SARANGEE. Finalist and received honorable mention for the American Marketing Association TechSIG Most Promising Dissertation Proposal Award. Paul Komiak. Faculty of Business Administration Assistant Professor- International Business and Finance Date of Hire: 2008. pkomiak@mun. JAE C. JUNG. 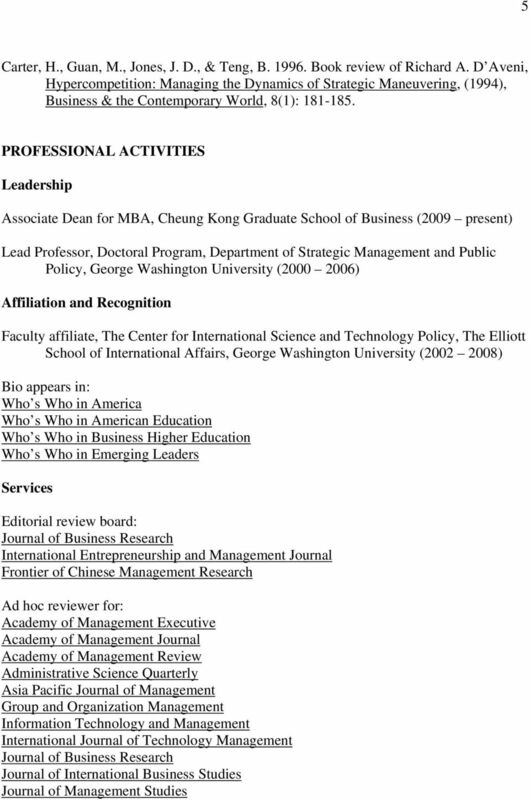 Henry W. Bloch School of Management, University of Missouri Kansas City 5110 Cherry Street, Kansas City, Missouri 64110, U.S.A.
Professional Experience 2012- Present Professor of Business Practice, Department of Management, The Hong Kong University of Science and Technology. SRABANA GUPTA. B.Sc. in Economics (With First Class Honors), 1986 St. Xavier's College, Calcutta University, Calcutta, India. Working Papers Abraham, M. Abraham, M. Abraham, M. Abraham, M. Abraham, M., Refereed Presentations Abraham, M. Abraham, M. Abraham, M. Abraham, M.
JINYU LIU, MSW, PhD School of Social Work Columbia University 1255 Amsterdam Ave. New York, NY, 10027 Phone: (212) 851-2246 jl4658@columbia. E D I T H G A L Y. UNIVERSITY OF TEXAS at BROWNSVILLE, Brownsville, TX, Spring 1997-Summer 1998. Master of Business Administration - GPA 4.